Writing papers and essays will always be a part of life, especially in school. There’s no way to avoid it, so the smart thing is to be prepared. Proofreading your work can be very boring but is very necessary to get a good score. If you use the Proofreading Checklist, you’re sure to get a better grade on your papers. 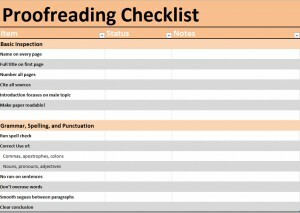 Using the proofreading checklist is a very simple process. The process has been split up into two main sections: basic inspection, and grammar, spelling, and punctuation. In the basic section, there are very simple but needed checks to be performed. The basic list includes must-have items like making sure a full title is on the first page. Be sure that the title sticks out, preferably with a large bold font to differentiate it from the rest of the body. Making sure your name is on every page and numbering all pages are also basic checks that should be made. When using information from outside sources, you should include references and a full bibliography in your writing as well. The question in mind should be fully answered in the paper and shouldn’t be avoided. Most of all, the paper should be easily readable. A smart idea is to not overuse words and have smooth segues between paragraphs. Elements like grammar, spelling, and punctuation should all be given special care. Writers should stay on top of their writing and run spell check often. Most writing software now highlights words that are spelled incorrectly, so it will make the writer’s job easier. Commas, apostrophes, and colons should all be used correctly. The same can be said for nouns, pronouns, and adjectives. Word processing software can do only so much, so re-read your own work to make sure everything runs well together. Lastly, run-on sentences are big problems in essay writing. If a sentence seems too long, split it into two sentences that relate well to each other. Proofreading your writing can be time consuming, but Checklist Template is here to make the process streamlined and easy. The next time you have to write a paper, use the free Proofreading Checklist.